I added three strips of arrows DSP then embossed the layer with the Ampersand TIEF and my Big Shot; finally I sanded it pretty good. Next I diecut So Saffron cardstock with the tabbed rectangle shape from the Apothecary Accents Framelit Collection, then stamped it with Crumb Cake and the Hardwood set. The One in a Million set furnished the sayings which I stamped in Tangerine Tango onto Pool Party then die cut with the Word Bubbles Framelit set; next I sponged around the edges with Coastal Cabana. The tangerine arrow was cut from the other side of the arrow DSP and added. Soft Suede Candy Dots and a knot of Gold Baker's Twine in the upper right-hand corner complete the card. 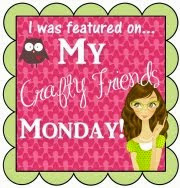 Accessories: Gold Bakers Twine, Soft Suede Candy Dots, Stampin' Sponge, Glue Dots, Dimensionals. Tools: Big Shot, Ampersand TIEF, Apothecary Accents Framelits, Word Bubbles Framelits, Sanding System. 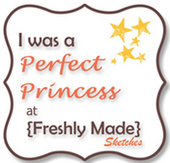 We would love for you to join us for the sketch challenge this week! 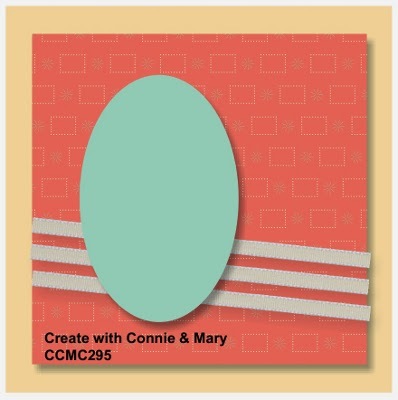 Just check out the guidelines at Create with Connie and Mary, create your card then link it over on the CWCC website. 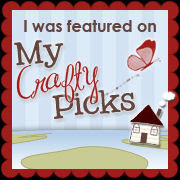 While you're there, be sure to check out the wonderful cards from the other designers... they are sure to inspire you! I love it when you visit, so thanks for coming by today! Have a great weekend, and stamp if you can! WOW! You rocked the sketch, Margaret. The background is so creative and I love how you used the Ampersand folder. Wow!! This is really awesome! I love ALL your details! Everything works perfectly! And I love how you used that Ampersand TIEF! 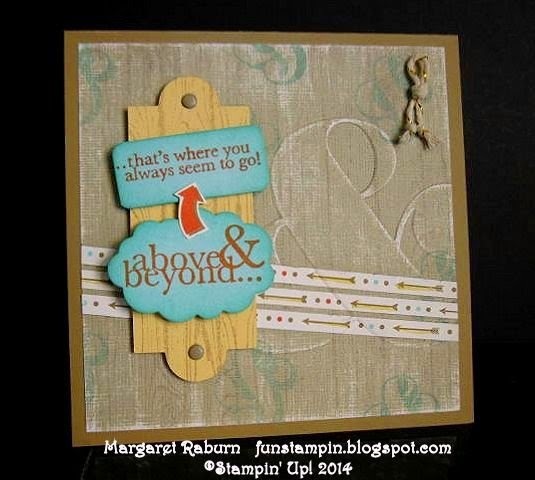 This card is amazing Margaret! So much detail and a really original take on the sketch! love the ampersands! What a great card! 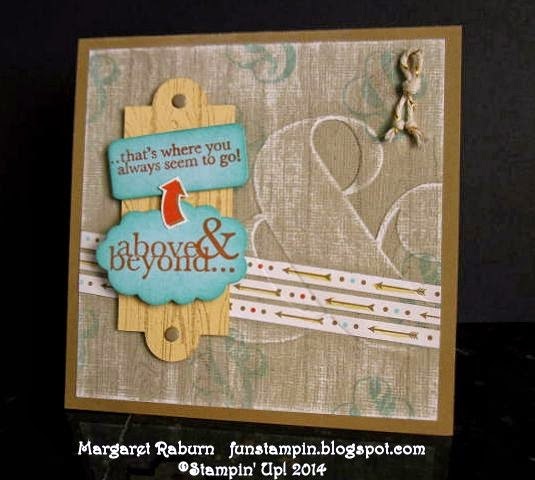 Love all the masculine details...gives this card a rugged, fun look! Very cool! This card is fantastic Margaret. So pretty how you offset the ampersand on the side of the card instead of the center! WOW! Love your card! I struggle using the Ampersand. I will be casing your card for sure. Love, love, LOVE this card!!! All the details...the ampersand, everything! Great job, Margaret! Wow! Wow! Wow! I absolutely LOVE your card!! So many clever design ideas, you really nailed this sketch!!! 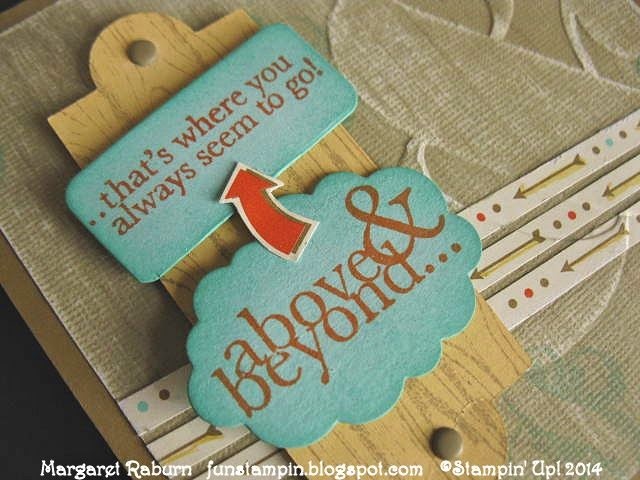 Love the way you incorporated the ampersand embossing folder into the card. The sentiment with the little arrow pointing is very sweet and clever!